The ROWE Scan 450i large format scanner represents a whole new class of high-tech scanners. 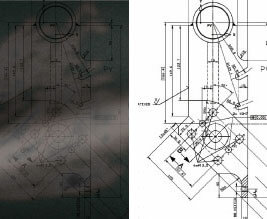 It incorporates groundbreaking innovations and is supported by unique technologies protected by patents. The ROWE Scan 450i wide format scanner features 3 models with scanning widths of 24″, 36″ and 44″. Standard equipment for all large format scanners is SuperSpeed USB 3.0 + RES (ROWE EFFICIENT SCANNING), ROWE ScanCloud and ROWE ScanMatrix+, which is a unique technology worldwide. Your advantage: scanning with the patented process ROWE DYNAMIC STITCHING; fully automatic transformation of originals with poor contrast into perfect scans due to the image improvement technology ROWE PRO LOGIC; brilliant, natural colours thanks to ROWE SELECTED TRUE LIGHT. 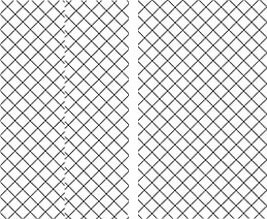 Also unique is a patented process that makes it possible to scan and, at the same time, recognise the width of the original as well as damaged or ripped corners. Colour Depth & Colour Space 48-bit color, 16-bit greyscale. Not only standard sRGB colour space, but also user defined colour spaces like Adobe RGB or Device RGB. ROWE SELECTED TRUE LIGHT Lighting of originals is exceptionally homogenous. Optimal alignment of the lighting angle to the reading unit. ROWE DYNAMIC STITCHING Continuously controls the scanned document data of each sensor and sets them together in real time. Any deviations that may occur are corrected automatically. ROWE PRO LOGIC Scan once for optimal results. Automatic process for filtering of dirt/background and highlighting of image information, ideal for originals with poor contrast. DOCUMENT IMPROVEMENT SYSTEM All changes can be done after scanning. No rescanning required. Any changes made are immediately displayed in the viewer. Automatic Width Recognition The width of the original is precisely determined during the scanning process. No forward and backward movement for recognition of document width. SuperSpeed USB 3.0 + RES Data throughput up to 1000 % higher compared to HighSpeed USB 2.0. Even compared to Gigabit Ethernet, ROWE SuperSpeed USB 3.0 is up to 300% faster. Download the complete ROWE Scan 450i Large Format Scanner Specifications here. 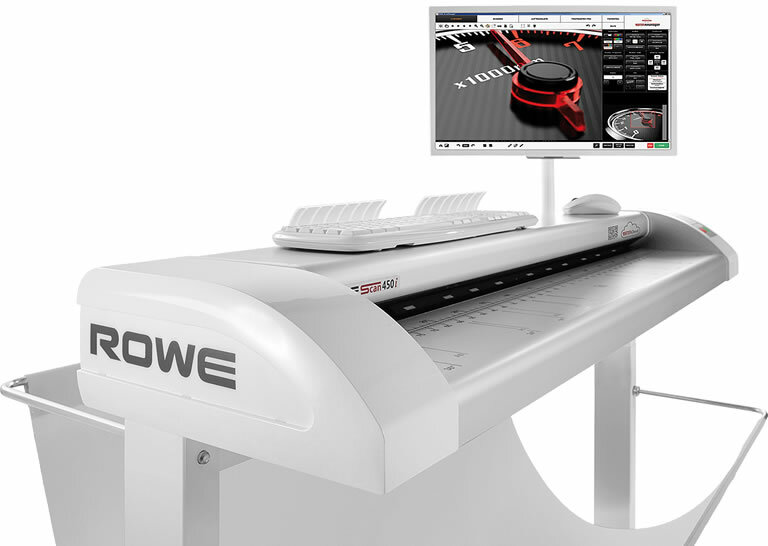 Explore other ROWE wide format scanner models here. ROWE ScanMatrix+ is ROWE’s unique, patented technology designed to ensure best possible scan quality. It consists of several digital core components. A new scan quality dimension is achieved through interaction between these components. You can capture superb colours with the ROWE Scan 450i wide format scanner: it supports not only the standard sRGB colour space but also user defined colour spaces like Adobe RGB or Device RGB. Simply compare image quality produced by standard large format scanners with that of ROWE Scan 450i. ROWE engineers have achieved a groundbreaking innovation: excellent scans, even when the document is folded or thin. The patented ROWE DYNAMIC STITCHING continuously controls the scanned document data of each sensor and sets them together in real time. Any deviations that may occur are corrected automatically. The Scan Sensor Technology used for the first time in the ROWE Scan 450i means the lighting of the originals is exceptionally homogenous. This is achieved by the optimal alignment of the lighting angle to the sensor. Together with the ROWE double lens technology, this produces excellent scanning results. The superior document enhancement technology from ROWE for copying and scanning with the “green button”. It ensures that imperfect originals, even those with poor contrast, are turned into perfect scans at the first attempt. This simple job with the “green button” saves valuable time and test scans. Faulty copies are a thing of the past. The optical resolution of 2400 x 1200 dpi (maximum resolution 9600 dpi) means the smallest details are visible. This is your competitive edge in large format scanning. 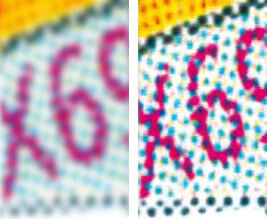 Just compare the image produced by ROWE Scan 450i at 2400 x 1200 dpi to the image at 600 dpi.